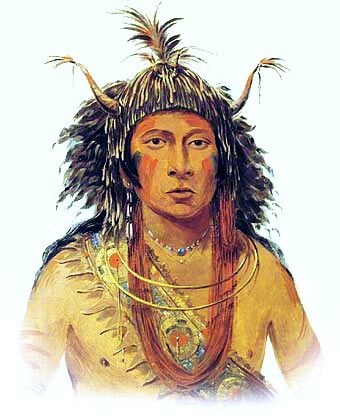 Indiana’s earliest inhabitants were groups of Native Americans known as Mound Builders.The Potawatomi were the last group of Native Americans to enter Indiana and the last to leave. Indiana is a state of the north-central United States. There are many famous Native American tribes who played a part in the history of the state and whose tribal territories and homelands are located in the present day state of Indiana. The names of the Indiana tribes included the Illinois tribe (Illini), Chippewa, Delaware, Erie, Iroquois, Kickapoo, Potawatomi and Miami. 10,000 B.C. : Paleo-Indian Era (Stone Age culture) the earliest human inhabitants of America who lived in caves and were Nomadic hunters of large game including the Great Mammoth. 1777: Indians encouraged by the British to attack the frontier Americans. 1785: Northwest Indian War (1785–1795) in Indiana and Ohio, also known as Little Turtle's war - refer to Little Turtle. The Americans suffered 2 humiliating defeats by the American Native Indians until they won the Battle of Fallen Timbers in 1794. The history of the European invasion brought epidemic diseases such as tuberculosis, cholera, influenza, measles and smallpox. The Native Indians of Indiana had not developed immunities against these diseases resulting in huge losses in population. Exploitation including the leverage of taxes, enforced labor and enslavement were part of their history, taking their toll on the Indiana Indians.